To help ensure all Canadians know they can watch Super Bowl LIII on DAZN February 3, the sports streaming service enlisted NFL legend, four-time Super Bowl champion, and Hall of Famer Joe Montana to spread the word that fans can watch the big game, as well as every single other NFL game, with NFL Game Pass on DAZN. Despite temperatures reaching -30° C, Montana traversed his way throughout the GTA just days before the Super Bowl and surprised unsuspecting superfans with signed gear and tablets – all fully loaded with DAZN subscriptions, so they can watch anytime, anywhere. "It was a great day traveling around Toronto and meeting such passionate fans up here," Montana said. "I loved seeing their reactions and I'm glad we were able to hook them up with DAZN ahead of the Super Bowl, so they can tune in no matter where they are and what they're doing." 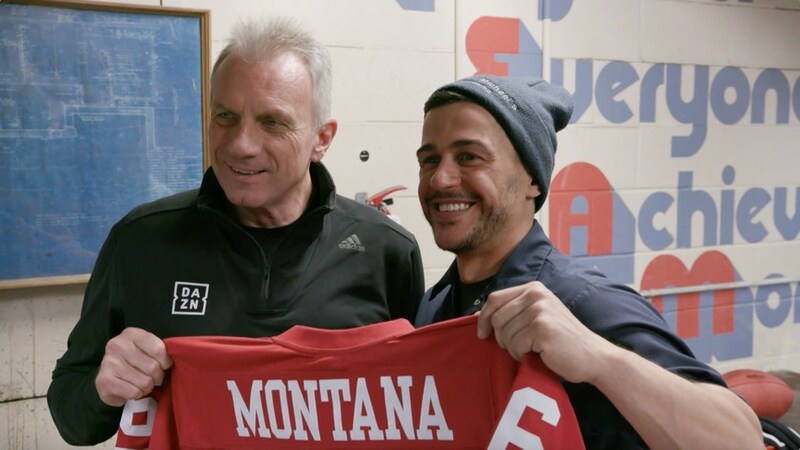 "Teaming up with the legendary Joe Montana for these fan surprises was a lot of fun," Joseph Markowski, DAZN EVP, North America, said. "We're all about making sports more accessible and affordable for all fans, and anyone just signing up for DAZN now will get to watch the Super Bowl for free." For the near quarter of Canadians that have either abandoned or never had cable, as well as for fans that might not be home on Sunday – a recent Angus Reid Forum survey revealed 37 percent of Canadians have not been able to watch a past Super Bowl due to work or social commitments – DAZN allows you to watch every single game whenever, wherever, so you never have to miss a moment. Canadian subscribers can watch every single game live and on-demand, as well as exclusively access NFL RedZone, through NFL Game Pass – including pre-season, regular season and post-season. DAZN's playback experience allows fans to pause live games, catch up on a missed match-up and experience the game in full HD, while its rich library of content also allows fans to relive the excitement of past Super Bowls ahead of Sunday's game. Fans can download the DAZN app on their preferred connected device or by visiting DAZN.com. At just $20 per month or $150 per year after a one-month free trial, that means Canadians just signing up now will get to watch the Super Bowl for free. Globally, DAZN is a live and on-demand sports streaming service created by fans, for fans, that is leading the charge to provide access to sports anytime, anywhere. DAZN guarantees no long-term contract, no bundles, just one affordable price for access to all the service's sports on connected devices including smart TVs, smartphones, tablets, games consoles and PCs. DAZN launched in Canada in July 2017 with a host of sporting rights and is currently also available in the U.S., Italy, Germany, Switzerland, Austria and Japan. DAZN remains the only place for Canadians to watch every single live NFL game, and is the exclusive home of RedZone. DAZN has also become the new home of UEFA Champions League and Europa League and offers MLS Live, MLB Network, Six Nations Rugby, boxing, MMA, cricket, and much more live and on-demand. In Canada, DAZN costs $20 per month after a one-month free trial or $150 for an annual subscription. These are the findings of a survey conducted on behalf of DAZN from January 11, 2019 to January 13, 2019 with a representative sample of n=1,000 online Canadian members of the Angus Reid Forum. The survey was conducted in English and French.